"'someone finally bought the dilaurentises' old house,' emily field's mother said." If you haven't been living under a rock and you have been living in the United States, then I'm sure you have heard that the wonderful (eep, or not) ABC Family is turning the Pretty Little Liars series into a teen drama television series. Teen drama: it's what they're good at. I knew I had to give this book a go before the series airs on June 8. I always hate watching a television show/movie before I have read the book. I feel like I'm not fully informed. I mean, what if they change something? Then I will have no idea what the true fans are griping about. I hate to be out of loop. I quickly hopped over to my library and put this little baby on hold, seeing as how all the copies were snagged. No surprise there. One fateful day Hanna, Aria, Spencer, and Emily met Alison at a volunteering event. Every since their lives have never been the same. They quickly became best friends and ruled the school with their envious inside jokes and slumber parties. But that all changes the summer Alison disappears. One minute they are laughing, and the next she has just vanished from the party. The girls who are left behind try to put Alison, and that night, out of their memory. And they almost succeed. Almost. Fast forward to their junior year of high school, and the girls have found that without Alison they have drifted apart. Alison, and their shared secret known only as The Jenna Thing, tied them together. Now that string has all but disintegrated. But the girls still have secrets of their own, secrets they are holding onto from the past that only Alison knew and new terrible secrets. Hanna is spinning out of control in her quest to stay skinny and popular. Aria has hidden a secret for her father for many years. Now that secret is repeating history in her life, with her teacher. Spencer has fallen for her sister's boyfriend. Emily has fallen for another girl, although she is scared to admit it to herself. When a mysterious person known only as A starts texting them, will these secrets they have tried so hard to conceal be revealed? 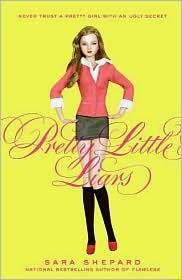 The premise of Pretty Little Liars recalled to my mind such books like Gossip Girl, The Clique, and Private. It's the reason I picked it up. It's also the reason I couldn't score it much higher than a six. Say what you will ye who only read high quality books, but I love the Gossip Girls of the world. They are super fun to read. However, I feel like Pretty Little Liars did not bring anything new to this category. A group of best friends with a dominating leader is found in the Clique; unhealthy friend dynamics in every single one of those books; someone returning with a Big Secret in Gossip Girl; extremely dangerous secrets abound in Private, let me tell you. Even the premise of a person revealing secrets through technology is the whole basis of Gossip Girl. "And who am I? That's one secret I'll never tell." I did enjoy Pretty Little Liars, but it didn't give me the feelings like when I first read Private or The Clique. Maybe my reading tastes have matured since then. My favorite chapters to read were the ones about Aria and Emily. For some reason I felt they were quite different to read about. The dominating perfectionist that was Spencer has been done far too many times before. These girls go to a top notch school; of course one girl will be a overachiever who is on every committee and sports team. That's to be expected. Even the whole schtick of her falling for her sister's boyfriend, which I honestly didn't see as too bad, has been done before. So what, little sisters always have crushes on their older siblings' boyfriends or friends? It didn't feel as big as secret as the other secrets. The same could be said for Hanna. She used to be the chubbier and dorkier of the group when everyone was friends with Alison, but suddenly she became gorgeous and popular. She is bulimic. She steals. She is insecure. Most teenage girls have insecurities, and it seems like in these stories that the most beautiful and mean ones are the most insecure. I don't know if that is true, but it seems like the trend. Bulimia: good to create awareness for, but lately I find if it's not portrayed as gritty as Wintergirls I want to skip through the pages until I arrive somewhere else. But Aria and Emily. Sigh. Now they were fun and different. The book starts off with Aria just returning to States and her home in the Main Line. Her family had been in Iceland since Alison's disappearance. Aria finds that she misses Iceland, with it's more kooky and unique people who got who she was. After Alison's disappearance, Aria had little to no friends and didn't enjoy school. She felt awkward and weird. Now she has blossomed with confidence only to be dragged back to the horrible place she thought she left for good. Upon her return, Aria expects to be alone like before, but imagine her surprise when she finds not only a handsome man but one who has been to Iceland! And on her first day back too. Too bad that man is her new English teacher. Can I just say that I want to be Aria? In no way am I saying I want to date my teacher, but I want to live in Iceland and travel to see plays in France. Aria was by far the most interesting, and I had character envy of that part of her life. Now, when she returns it gets a little weird with her teacher, but even that I felt was interesting to read. Emily is a young girl unsure of her feelings on love. She proclaimed her love once to a girl when she was younger, only to have those feelings lorded over her. She is dating a boy on the swim team because everyone thought they should date. But then she gets a new neighbor, a girl from California, and her feelings roller coaster. My heart went out to Emily so many times during this story. I applaud Pretty Little Liars because I think it was original to involve a coming out story with the whole secret-telling business. With her conservative parents and more than likely conservative school, I felt Emily's anxiety of her secret getting out. More than anyone else, I felt her secret was the worst to get out before she was ready. Throughtout the book, the relationship between Maya and Emily is unsure and rocky. It never becames stable, but it ends on a hopeful note so I'll just have to pick up the next one to see what happens. Rating: 6 out of 10. Worth reading especially because of the television series coming out. But don't expect much more than a guilty pleasure. There were a few deeper elements in the story, but when I say few I mean few. I plan on picking up the next one: to read more about Aria and Emily, to find out who A is (I was tricked through the whole entire book thinking it was the wrong person! You got me Sara Shepard), and to learn more about The Jenna Thing. Don't forgot about the series airing June 8th. My review of the pilot will be up sometime later in the week. "all she found of the little tin soldier was a small tin heart"